Today would be a different sort of activity. Our friend, Trudy Angel, who we had worked with when we first came to Baja in 1979, has her own company now. She does paddling trips, biking trips and mule packing trips. For a change of pace we headed up towards San Javier to meet Trudy and do a day ride thru the mountains. Some of us were more excited than others. We are not counting the mules as having an opinion. We mounted our mules and got a short lesson in the art of mule riding. It was mainly follow the leader and it is ok to let them drink, but eating is not ok, unless we want a really long break. There is a natural water source in these mountains and some streams were flowing, the ranches looked healthy this year.. This is not always the case as we saw the bones of several animals that had died in recent years from the drought. We ended our mule ride at a ranch, where we spent some time talking to the owners who had lived there their entire life. They were very resourceful in using what was available. Several places had flower pots made out of old tires. 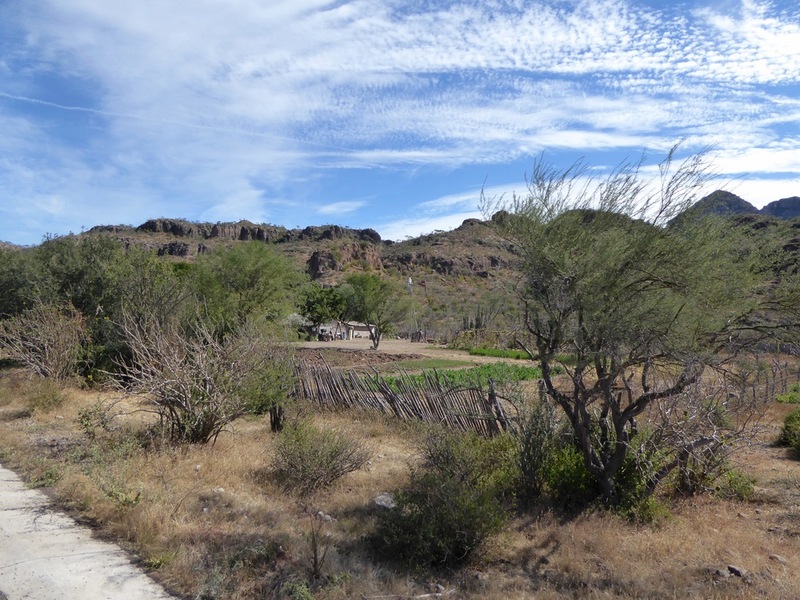 The next stop was driving to the town of San Javier. Last time Don and I had been there was 30 years ago when Ryan was 8 weeks old and we had gone there for a Christmas celebration. The old mission is in good repair and has some of the original interior. A walk behind the mission led us to old olive trees that were brought over by the Jesuits in the 1600's A blue butterfly got our attention. Back to where we started, we had some tea, made friends with the goats and checked out the garden. It was a good day, the boys take off tomorrow.